If you are looking for insight on how to improve your trees, plants, shrubs and overall landscape appearance, you have come to the right place. The Woodsman Tree Company’s monthly care calendar provides both our community and clients valuable time and cost savings information. Take a few minutes to familiarize yourself with our useful landscape tips on keeping your property in optimal condition. If you have any questions about our services for tree and shrub care, please contact us at your earliest convenience by selecting our “Contact Us” section of this website. A good time to finish cleaning up old leaves around trees. They can carry disease and harbor over-wintering insects. Continue inspecting all landscaping for any storm damage to trees and shrubs. Prune ornamental & shade trees because branch structure visibility is best and insects/diseases are inactive. Safety-prune structurally weak limbs/branches in order to avoid storm damage to family members, sidewalks, lampposts, play sets, garages, autos, utility wires, and residences. Take care of any tree removals. Removing trees while the ground is frozen minimizes the impact and potential damage to sensitive areas of gardens and lawns. Plan to have fruit bearing trees pruned before bud break. Plan for your spring planting needs. Begin to consider the coming insect onslaught that starts in spring. Continue dormant pruning of ornamental and shade trees. Consultation for spring planting of trees. Dormant oil spray for control of over-wintering insects. Check for signs of Borer Activity, scale, aphids and other common pests this season. Examine your trees for signs of insect egg masses on the trunk or branches. Dormant oil spray and Systemic Insecticide treatments to help control overwintering insects before they hatch. Begin spring liquid fertilization program for trees and shrubs, which will promote new growth. Plan and prepare for your spring tree planting. Nurseries have lots of fresh plant material now. Consider mulching to retain moisture and inhibit weed growth. Periods of rainfall can vary. Be attuned to weather changes and water new and established trees and shrubs accordingly if rainfall is inadequate. Pay close attention to dead or hazardous trees. Remove dead or hazardous trees. Prune and shape hedges after new growth has appeared. Schedule for early plant health care program to help manage damaging insects and diseases. Plant new trees once the ground has thawed. Check for insect and disease damage on trees and shrubs. 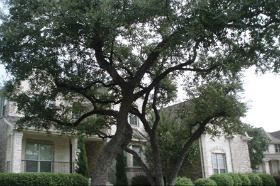 Observe trees for deadwood and especially pecan trees due to their method of self-pruning. Dead or hazardous tree removal. Implement a watering schedule for all plants to help prevent drought stress (check out our tree watering page). Damaging insects can be very active at this time. Call your arborist if you detect trouble. Be careful not to wound trees with lawn mowers and trimmers. Begin paying attention to mosquitoes. Proper pruning of trees, mainly deadwood removal. 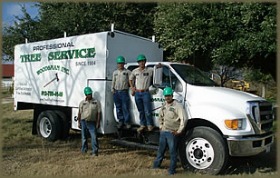 Removal of dead or hazardous trees. Spraying landscape for mosquito control. Look for drought stress. Signs include foliage wilting or curling. Pay attention to dead or hazardous trees. Pay attention to insect damage. Prune climbing roses to stimulate second bloom. Prune evergreen plants and shrubs. Prune ornamentals, shade trees, and shrubs. Spray landscape for mosquito control. Recognize any early fall color as an indicator of plant stress and low plant vigor. Keep fruit trees nourished and watered during summer months. Identify potentially hazardous trees prior to windy season. Acorn Reduction injections (30%-50% reduction in acorn drop at 50/50 % success rate for following acorn season). Inspect trees for premature leaf drop. Continue watering trees and shrubs until ground freezes. Start fall liquid fertilization of shrubs and trees to promote feeder root growth. Consider deer protection for broad-leaved evergreens and trees. Verify power and telephone lines are clear of branches before severe weather arrives. Always consult a professional arborist when dealing with wires. Be sure to rake up and dispose of leaves to prevent possible spread of disease. Prune, brace, and cable to prevent winter damage. Winter protection for palm trees by wrapping and feeding with potassium. Mulch evergreens and trees before ground freezes. Thoroughly water newly planted trees before ground freezes. Check for signs of potentially hazardous trees before winter: heavy deadwood, cavities, and exposed or damaged roots. Implement winter protection program for trees and palms. Finish tree and shrub fertilization. Install tree guards to prevent rodent damage to susceptible trees. Pay attention to hazardous trees. Remove dead and damaged limbs from trees with maintenance pruning. Prune ornamental and shade trees to prevent storm damage. Winter protection for palm trees.